It seems that Specs2 support is broken. 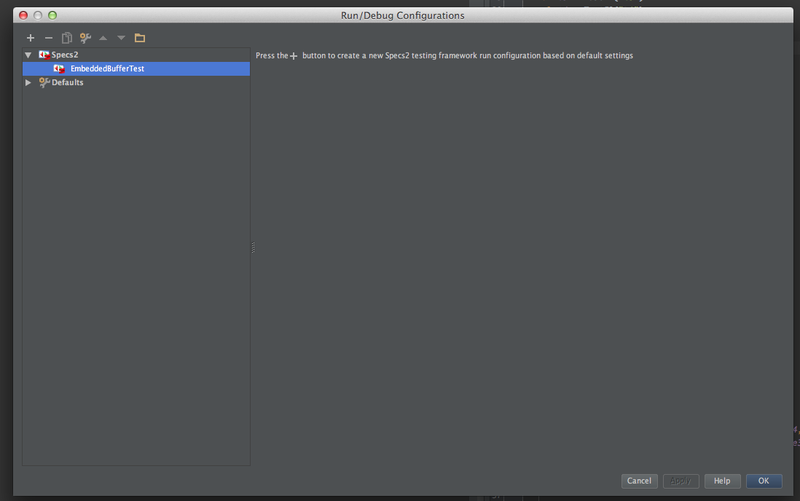 The 194 version of the plugin (in the freshly released 12.1 Intellij) still worked, but as from a certain later version, even the dialog box for Run/Debug configurations shows a mere empty sheet when trying to click on a (temporary or saved) run/debug configuration. Trying to add a new Specs2 run/debug in this dialog box (using the + button) is not even possible: clicking does not seem to have any effect. Actual version for IDEA 12.1 is 0.7.213. I checked the error message, and the issue appeared to be linked to a missing Maven plugin. I re-enabled it, and now everything works again.